Jocelyn never expected to be the legal guardian for a pack of pedigreed Labrador retrievers. She strives to uphold the “Best in Show” standards her pack requires, and finds love, family, and forgiveness in the most unexpected places. Sign me up to receive news about Beth Kendrick. A fun and rather cute read. I don't often read books featuring animals but this one was rather entertaining. Worth reading. I received an advanced copy of this book from First to Read in exchange for an honest review. This is the first book I have read in this series, but I did not feel lost having not read the previous books. And it definitely won't be the last book I read by this author! As a dog lover, the cover and the title immediately got my attention. I was happy that dogs were actually featured in the story. I really enjoyed the story. This was a fun read! 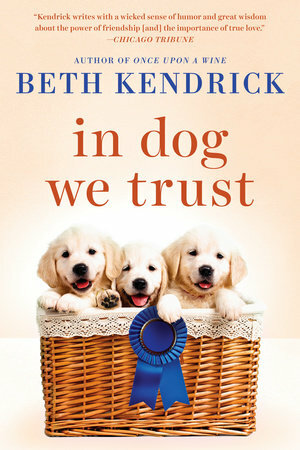 In Dog We Trust by Beth Kendrick was such a fun read. This is the first time that I have read this author and it won't be the last. When I saw the puppies on the cover, I was hooked. If you love dogs, the seaside and romance, you will love this book. Jocelyn is a good hearted person who cares about people and has so much love and compassion for the dogs. Because of that, eccentric Mr. Allardyce hires her to care for his show dogs and eventually leaves them and his mansion and money to care for them to her. His son Liam is not a happy camper. The fun begins! This was truly an enjoyable read. In this fifth book in the Black Dog Bay series, Jocelyn Hillier's life has just turned topsy turvy, and more than once in relatively short order. For starters, Jocelyn is jogging one day on "Rich Person Road", which is actually Shoreline Drive. Jocelyn runs a linen service along with her mother, so she is definitely glancing at the other side of things. During her run, Jocelyn manages to save a couple of dogs from being run over. She so impresses their owner, Mr. Allardyce, that he insists on hiring her to care for all of his dogs, three Labrador Retrievers. Suddenly, Allardyce dies, and Jocelyn is named legal guardian to the dogs, as well as a huge inheritance that comes along with their care. This includes her living in his incredible mansion - correction - her mansion. When she learns this while at the reading of the will, she isn't the only one shocked. After all, she was a glorified dogsitter. Among the people outraged is Liam, who claims that Allardyce was his father and that he was robbed of his inheritance. Jocelyn has been fighting her entire life. Raised without a father, she is blessed with a very strong mother and has learned quite a lot in her life. One thing for certain is that she is not going to back down easily. If Liam wants a fight, he's got one. Meanwhile, Jocelyn has been dating Chris, who happens to be the same man that almost ran her and the dogs over. More than once, Jocelyn wonders if she is good enough for a rich man like Chris. What social faux pas does she chance making? Minor things that bothered me in the book. For example, Jocelyn was very comfortable riding with Chris, a perfect stranger, but not Liam, who she had been around much more. Minor inconsistencies like this offset my rating. Then, I wasn't too keen on certain issues she took her mother. Despite those concern, I found this to be an enjoyable read, and I loved the storyline. There were quite a few humorous moments in the story, especially when it came to the antics of the dogs. Although women's fiction, I am someone who enjoys happily ever after, and I do love how the author played this out. We got to see Jocelyn's growth throughout this entire process. And, needless to say, all of the dogs were a delight! I definitely want to grab this entire series to-date as well as any future titles. 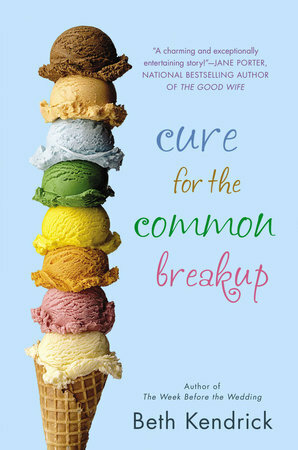 The series consists of Cure for the Common Breakup, New Uses for Old Boyfriends, Put a Ring On It and Once Upon a Wine. Despite the fact that I haven't yet had the chance to read them, In Dog We Trust did quite well as a standalone. Many thanks to Berkley and to NetGalley for this ARC to review in exchange for my honest opinion. Summary: One moment, one decision can change a life. Jocelyn Hillier is a busy woman- she's taking care of the laundering business she and her mother run while Mom's laid up after surgery. Then there's all the side jobs- helping her best friend take care of rental properties. One morning, during a run, she risks her life to save two dogs from a speeding vacationer. One of those dogs, Carmen, just so happens to be a show dog- one of Mr. Allaryce's pedigree Labrador Retrievers. Suddenly she has a new boss in Mr. Allaryce- taking the dogs out for runs and playing with them- and a new boyfriend in the vacationer, Chris. Balancing everything is a tight rope but she loves it- surly boss and all. Six months down the road, Jocelyn is once again single and, upon Mr. Allaryce's death, guardian to the pampered trio she used to walk. Going from living in a small house to one of the premier real estates in the area while trying to keep her mother in line and their business up would be enough, but it can't be that easy. She has to learn how to not just love the dogs, but train them and care for them. Then there's Liam, Allaryce's son and a thorn in her hide. Can she keep herself sane and the dogs Best in Show? My thoughts: First, I didn't realize this was part of a series, and I would absolutely have read the other four books first. That said, I don't think it's completely necessary to know the other books in order to enjoy this one. I don't feel like there was anything I was missing and it seemed to work well as a stand alone novel. I loved Jocelyn to an extent- her strength, her drive, her adaptability, work ethic and loyalty (this girl knew how to hustle, but always had time to help her mother or friend). That said, her fascination with Chris and her inability to see all the crap he did really confused me. One moment she's a strong, independent woman; the next she's cooing over this guy, talking about Paris and looking at rings. What gives? Also, if some guy nearly ran two dogs over- let alone me- I would not be starting a relationship with the guy. Then there's Liam. One minute they hate each other- sworn enemies that will see eachother in court, then Hell. Then suddenly he's asking her out on dates, kissing her, and his mama is showing up calling her his girlfriend. Hello? Shouldn't she have had more of a say in this? I ended up liking the relationship in the end but the beginning was kind of messy to me. Odd romances aside, I loved how the characters interacted. The plot was interesting and the story ran at a fast clip. This was a really good, fun read that left me feeling refreshed. I think it would be just the thing to pull someone out of their winter blues. For me, this is a three and a half star book. I would still recommend it to anyone and I will be searching for the other books.... but it wasn't a total hit with me. On the adult content side, there's some language and sexual innuendo, but nothing over the top. I would give it to my niece, but younger teens.... maybe not. I give it a four. I was lucky enough to receive an eARC of this book from First to Read in exchange for an honest review. My thanks. 3.5/5 I adored this book. I wasn't sure what to expect and it started out uncertain for me, but the more I read the more I couldn't stop. This is the first book I've read in the series and I can't wait to read more of them. Jocelyn is a great independent female character who has to battle through several obstacles while loving doggies. I had 2 ehhs: 1. the romance between Jocelyn and Liam didn't feel there, it hints at it, but nothing is really shown. 2. When the moms go to the casino and said they had a surprise, we never found out the surprise (unless I missed it). In the end it is a lovely read, it will make you chuckle, fume, smile, and possibly tear up. I do enjoy reading a story with a strong female character, but this woman is a bit of a ditz. (Spoiler alert) Hard to believe a rich guy who treated her terribly while he was alive, would die and leave her his mansion and his champion canines. Her life is a farcical drama of right man, wrong man, jealous dog trainer and emotions on overload. I see that this is an installment from a series. I would not have known. The author has created a fantasy world that will take you no time to read. My thanks to the author and Penguin's First to Read program for a complimentary copy. When I obtained a free advance reading copy of "In Dog We Trust" (courtesy of First to Read), I had no idea it was the fifth book in a series. It didn't even occur to me that this story might be building off of previous plots or character developments until I started skimming over other reviews! I think that speaks volumes (pun intended) with regard to Beth Kendrick's ability to hook new readers right from the get-go, and this isn't necessarily a genre I gravitate toward (I was sold on the cover alone - cute Labrador puppies!). The story is far from original. Jocelyn is a "plain Jane" who provides cleaning services to the rich and famous residents of Black Dog Bay, yet in a bizarre twist, she ends up immersed in their world of glitz and glamour. While navigating unfamiliar territory, Jocelyn develops an unexpected affinity for the types of individuals she has made a point of avoiding throughout her adult life. I wish more effort had been spent on developing the characters' backstories vs. the back-and-forth dialogue that became repetitive and juvenile at times. We learn a bit about Jocelyn's and Liam's troubled relationships with their fathers, but even then, we don't get to dive into a deeper psychological exploration of how that molded them into the individuals they are in the story. As a result, I never felt invested in the characters' outcomes, and honestly only cared that the dogs had happy endings. "In Dog We Trust" was a relatively quick read and playful at certain points, not to be taken too seriously. I would give this book 3.5/5 stars. So this is the fifth installment in the Black Dog Bay series and unlike what I usually believe, I honestly think you can read this out of order with no real issues at all. Yes, there are some crossover characters but honestly, if you want to get a feel for this author and this series, it is quite easy to start with "In Dog We Trust." Black Dog Bay is a local spot in Deleware where people go to heal heartbreak and make new paths for themselves. Many of the inhabitants have been burned or dumped and they come to the area looking for the elusive black labrador which signals their luck is about to change. However, Jocelyn has spent her whole life in town, working with her mother for a laundry services which caters to the many local businesses and hotels. One morning while jogging, she saves the show dog of a rich old man living on the beach and her luck changes. She ends up falling in love for the idiot driving the car and before she knows it, she is left as the executor for the dog's estate once their owner, Mr. Allardyce, suddenly dies. I really liked Jocelyn and her best friend Bree who realizes that her friend's future husband is not all he is cracked up to be. In addition, the reader is also introduced to Mr. Allardyce's estranged son, Liam, who shows up wanting his inheritance and despite loving dogs, can't believe his father left his estate to his four-legged children instead of him. "In Dog We Trust" is a fun book and a great way to spend an afternoon. Jocelyn is such a dog lover and truly makes every move thinking about how it will effect the dogs in her care. There are even some adorable puppies born, including one which Jocelyn's mother names George Clooney. There is some romance, which is to be expected with this series, but friendship, family and pets are the main themes and everything else is just a side note. And on a side not of my own, there is a unique auto mechanic named Otter which makes a brief appearance in "In Dog We Trust" and I really hope Kendrick explores his character more in depth in a future installment. I would highly recommend this series to animal lovers or romance lovers or even those who prefer a mixture of both. When I received my copy of this book, I was wortied that I would be lost because it is from a series that was unfamiliar to me. I didn’t need to worry! This book can be definitely be read as a stand alone and has me wanting to read the others. There are s few parts where it could have turned into a sappy romance, but it honestly never did. It has wonderful characters and just enough humor sprinkled throughout. The main character, Jocelyn finds herself thrown into a new job dogsitting for a well to do client. The way she handles hr situation and the other characters that she becomes involved with is like a breath of fresh air. I wish I knew her in real life. I think we would be friends! I thoroughly enjoyed this book from beginning to end. Thank you First to Read for this ARC! When I went to start reading this book, I thought I might be in trouble. First off, it is the 5th in a series. Second, apparently it is a romance book. Imagine my delight when not only did it not have all the cliche markings of a serial romance book, but was incredibly enjoyable and I never felt like I had missed out on something by not reading the previous books! In fact, this book read like a favorite cozy series. I kept having to remind myself that no one was going to be murdered! On a picky note, I was surprised that Jocelyn let the AKC show dogs eat random bits of people food. I realize she said she wanted to keep them happy, but it seemed out of character for how the story was set up. Otherwise, I felt character development was well done. I didn't feel like there were things left out about the main characters that maybe I should have known from previous books. And I really enjoyed the story, even it's tied-with-a-bow ending! I thought that In Dog We Trust was delightful! I enjoyed the characters and the humor found throughout the story. The main character Jocelyn helps her mother run a laundry rental business in a beach town. And Jocelyn hangs out with her close friend Bree in her downtime. These two always have an enjoyable and interesting time when they are together. Then one day Beth has a run in with a wealthy man and his three pedigree Labradors and her life will never be the same. After the dogs’ owner passes away, she ends up the guardian of the dogs and living in their fancy home. After this, it seems as if there is never a dull moment in her life. Jocelyn finds herself in some interesting situations as not everyone is happy with what was in the final will. This story is full of fun characters and dogs if you are looking for a fun read with a little romance in it! This is an interesting novel. It took a bit for me to catch on. I assume there is another novel with the same characters before this book? It was well written. I couldn't relate with the heroine well so it was hard for me to finish the book soon enough. I believe there would be others who would enjoy this novel more than I did. I'd give this book a high 3 stars. I like dog stories. I don't have to walk the dogs or clean up after them, so the stories give me just enough of the enjoyment of dogs. It's kind of like being a grandmother; you can spoil the child and give her back to her parents when it's clean-up time. With this book I get three Labrador Retrievers, show dogs all, and their particularities without getting whipped by their very strong tails. Our hero, Jocelyn, inherits these dogs, a huge beach house and more money than she's ever imagined. A townie, she tried not to get involved with the summer people, but that didn't work. With the dogs, she has to deal with the original dog's owner's son, his mother, the dog trainer (remember these are show dogs), her BBF's drama, and her own mother. Then there is her own father, another rich summer person who gave her an unexpectedly expensive painting instead of a relationship. All of these things force Jocelyn to expand her world in new and interesting ways. There were points in the story that I was afraid it would turn into a romance. There are romantic elements, but they are sprinkled about and don't take over the book. This is Jocelyn's summer of growth and change, and it's a good one. I received the copy of this book that I read for this review from First to Read. So cute!! Jocelyn is a dog-loving, warm-hearted person who is just trying to make a living doing laundry service in her tourist-trap hometown. In saving a dog’s life, she’s hired by a wealthy, elderly man who cares for only his dogs to make sure his three pure-bred, prize winning Labradors are well-loved and well-walked. This book is chock full of fun dog (and puppy!) moments, as well as great family and friend relationships. I really loved the best friend Bree, who is smart and funny with romantic troubles of her own, and she and Jocelyn support each other like the fantastic friends they are. While fun, this book also has on-point views about the locals having to mix (and trying to survive) the seasonal rich who drive up the price points in real estate, restaurants, and living conditions. Jocelyn tries to make her way and mix in this world, both for the dog’s sake and her own romantic notions, all while trying to believe that money would never change her. When she does get a glimpse of that type of money though… she discovers the problems and attention that can come along with it. Overall, very fun and well written. A very enjoyable read! I received an advanced copy of this book from First to Read in exchange for a fair and honest review. Overall, this book is completely different from what I normally read, so for that reason, it felt like a breath of fresh air. Light and somewhat predictable, I found reading this book to be a pleasure! A quick little escape that begins with the first paragraph and continues right on to the end - the characters are instantly interesting and have enough depth that you feel engaged along the way. As someone who a spends summers in a place very much like the one where this is set, I liked seeing how the characters navigate the social lines, as well - it made for a nice subplot. I did not initially realize that this book was part of series, and it does not need to be read as such! I can imagine that a background in the series would make for deeper enjoyment and context, but it is in no way necessary! Read like a Hallmark movie. I didn't like it. I received an advanced copy of this book in exchange for a fair and honest review. This is part of the Black Dog Bay series, but can be read as a stand-alone and not be lost while reading it. This is the story of Jocelyn and a pack of pedigreed dogs that she inherited from Mr. Allardyce. She has to deal with Mr. Allardyce’s son who decides to sue her for the house and almost everything that she has inherited to take care of the dogs. But, sparks are flying, and well..... This is a great book that I enjoyed reading and am looking forward to the next one in the series. I loved this fantastic book. I didn’t know that it was part of a series and read it as a stand alone, and it worked so well as that. This is a quick read that shows what someone will do to keep the pups in their lives safe. I absolutely loved this sweet book. It was a very quick read. Though I must admit that I love the trend of romance novels including animals. In this story, Jocelyn becomes the guardian of three beautiful show dogs. She winds up in a battle with Liam, her benefactor's son. Nice characters and story. I thought it was well written. I would recommend if you enjoy light romances with a dash of puppy love. This was a very quick and enjoyable read. I really thought Beth's characters were very well-developed and interesting. It was a great way to spend an afternoon. This book was a 5 star delight! This was my first by Ms. Kendrick. Her characters were very interesting and varied. The whole basis of the book was unexpected in that the main character, Jocelyn who has been dog walking some pure bred Labs for an older curmudgeon of a man, is named as heir to the dogs and their extravagant home on the beach upon the man's death. You can just imagine the uproar from his kin! No one was more upset than Liam, the man's estranged son. Jocelyn's new lifestyle is a shock to her and everyone who knows her. She struggles to maintain the show status of the dogs and deal with the law suits that keep springing up. She's attracted to Liam, but what should she do about it when he has her served by the courts? Is he really a good guy or is he just money hungry? There was a very unexpected but totally satisfying end to the story. You won't be disappointed! I received a copy of this book via First to Read in return for my honest thoughts. 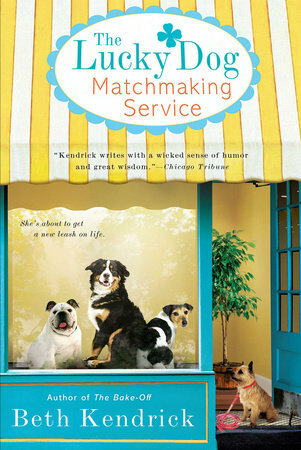 This is a fun novel for lovers of chick lit and dogs. Jocelyn is a good character. It didn't take long for me to get interested in her. Her frustrating love life is a mess. I kept rooting for her to find the kind of nice guy she deserved. And Bree is a great companion for Jocelyn. I love their smart dialogue and quips. There is nothing really deep in this novel, just a light and funny romance. You will learn quite a bit about dog breeding and showing. You'll have a fun romp through two sides of society in a Delaware beach resort town, the rich who spend the summer and the others who serve then drinks and wash their linens. You'll experience different situations of courtship and marriage. You'll read of faithful friends and money seeking enemies. I recommend this novel to readers who enjoy a lighthearted and humorous adventure through the love life of a sweet caretaker of a few rambunctious dogs. Discussion questions are included so this would be a fun novel for a ladies reading group. I received a complimentary egalley of this book from the publisher. My comments are an independent and honest review. **I received a copy for free via the Penguin First to Read program in exchange for an honest review** I am a big fan of Beth Kendrick and have been reading her books since college. I've been checking obsessively over the past couple of years to see if she had a book coming out and I was thrilled to see this on offer from the Penguin First to Read program. While this was a fun, easy read, it's not my favorite in the Black Dog Bay series. On the positive side, this book is entertaining and I really liked the majority of the characters. The story is light and frothy, and there were a couple of times where I laughed out loud. Unfortunately, I didn't love this one as much as her others.. The pacing felt a bit off in the second half of the book and the ending felt very rushed. Also, while I liked the chemistry between Liam and Jocelyn, I needed more to their love story. I got their attraction, but the jump to being in love with each other was a bit rushed. If you are a fan of fun romances and Beth Kendrick, then I would recommend this read. It's not perfect, but it's a generally entertaining read. I have read quite a few of Beth Hendricks books and have enjoyed them. This book was no exception all though I will say there were no surprises. From the beginning you knew exactly how the story was going to play out. Jocelyn inherits championship dogs and the millions of dollars that go with them after her employer dies. Liam, the dead mans estranged son, returns to fight the will. You can guess the rest. The book was fine for a non-thinking light read. Thank you Penguin Random House for the opportunity to read this advanced copy. I was immediately drawn to choose this book by its title. First, any story that includes a focus on dogs deserves my attention. Second, any book title that includes such subtile irony has great potential in my estimation. In Dog we Trust by Beth Kendrick is the story of Jocelyn Hillier and her role as guardian for several extremely wealthy Labrador Retrievers. Joss had always wanted a dog but since she was still living with her mother, the answer was always no. Then a set of unusual circumstances led her to be chosen by the extremely wealthy Peter Allardyce to care for his prize winning show dogs. Things make an abrupt turn when Mr. Allardyce abruptly dies leaving his estate in trust to his dogs and Jocelyn was named guardian. Joss is immediately met by Mr. Allardyce's angry estranged son who believes he is the rightful owner of the estate. What follows is the slow transformation of Jocelyn Hillier from a working class permanent resident of this Delaware shore resort town to someone who lives in and upper class home living a considerably more luxurious lifestyle. I found that I was immediately drawn into this book because I share the author's love of dogs. Like Joss I have frequently found that the best and most honest people around are the dogs I meet. I also know what it must have been like to live in Black Dog Bay. I once lived in a waterfront resort community. Along the shore were a line of multi-million dollar homes with exquisite views. Like Jocelyn, her mother, and friend, I know the divide that can be felt between those who live in town permanently and those who come to the huge houses only for the summer. I have fantasized what it would be like to suddenly own one of those homes, to wake up and go to work and come home to the magnificent view and luxury of the "nice" home. Jocelyn suddenly finds herself in that exact situation and discovers that being rich isn't as easy as it had seemed. There is a lot more work--and lawsuits--that must be dealt with. I enjoyed this book from beginning to end and give it my hearty recommendation. I was given this book by First To Read in exchange for a free and honest review. In Dog We Trust was a fun, light read. Without giving away the ending, I was pleasantly surprised by the path the story took. Several times I thought that I "knew where the story is going", expecting a predictable conclusion, but then there would be a wrinkle to keep me interested. 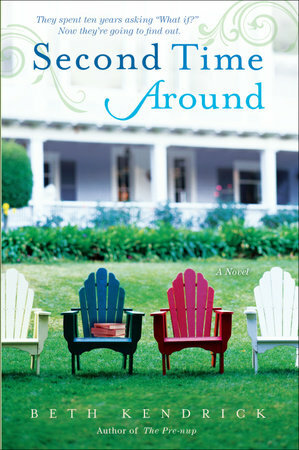 Based on this book, I will look for other books by Beth Kendrick... including hopefully a sequel to this one someday! A quick and easy read. The story was ok but could have been better. As other reviews have stated this was an easy and predictable read. First time I have ready anything from this author; I did not warm to the writing style (or characters and storyline) so not sure I would continue on with other books by this author. Quick easy read about family, dogs and forgiveness. I thought it was a sweet story. I loved the interactions between Jocelyn and her best friend the best. The rest was very predictable but an enjoyable read. The book was cute and easy read. I felt like I couldn't get into the story at first but once it picked up I enjoyed it. It's my first book by this author so it was good enough. For the most part this was a pretty decent book. It did feel like there were a few too many story lines going on. In fact, I felt like we could have skipped the entire relationship with Chris and just let him be the tool to bring Jocelyn to Mr. Alardyce and the dogs. I also felt it strange she left the plot point of Jocelyn helping Bree with school open. She never told her about the money she saved for her. I would have liked to see that come to fruition. I did enjoy the book overall, even if it was a bit awkward and lopsided at times. I would probably read another book by Beth Kendrick in the future. The book was an easy, quick read. I know the area for the setting of the book. It was easy to follow. This is the first I have read by Beth Kendrick. The characters were believable and realistic. I really enjoyed this book. It was a nice, light diversion from the other books that I’ve been reading lately. I’ve read other books by this author and as usual, she did not disappoint. If you love rooting for the underdog, read this book. This was a fun, quick, light read. If you are looking for a book that is not heavy, but is interesting enough to keep you involved, this is a good choice. Think "Hallmark Movie" - overly-cheesy details. Not bad if you just want a literary distraction between heavier reads. If you are looking for a fun, quick read, In Dog We Trust does not disappoint! Basically, the main character, Jocelyn, a local year-round resident in town,inherits a house, and 3 show dogs (including one who’s pregnant), from a wealthy older gentleman who owns one of the expensive houses on the beach. His son, who he never had a relationship with, believes he should inherit his property and fortune, and goes after Jocelyn for it. Of course, they end up falling in love. As many of the other reviews have stated, this story is quite predictable. But even so, I enjoyed it. Look forward to reading more by this author. Thanks to Penguin for providing me with an advance copy of this book in exchange for a review. I have not read any other books by this author. However, I did very much enjoy this story. It was a quick, sweet and easy read. The one thing I didn't like was that I found it to be very predictable and some parts of the story were never addressed. But all and all it was a good book and I would read other books by this author. In Dog We Trust was a sweet, light read. I haven’t read anything by this author before, but now I definitely want to look up the previous books in the Black Dog Bay series. I spend a lot of time at the Delaware shore, so I loved reading a story set in that area, even though it’s a fictional town. Jocelyn’s love for the dogs and her willingness to do anything to keep them was really sweet, and by the end of the book I really liked how she and Liam worked together despite their rocky start. The solutions to some of the main conflicts were a little too simple and unrealistic, but overall I really did enjoy the story. If you love dogs and enjoy light romance, I definitely recommend this book. I was excited to have the opportunity to read an advance copy of this book (thanks to Penguin's First to Read program!). I have read another book by this author that took place in Black Dog Bay and looked forward to returning to the town. This absolutely can be read as a standalone. It was nice revisiting the setting, and the characters were all new to me. Black Dog Bay has a reputation as a tourist destination, especially for women with broken hearts. The local businesses cater to this population and have fun names like "The Whinery." The main character, Jocelyn (Joss), is a local who works with her mom. They provide rental linens to seasonal visitors. There is very much a townie vs. summer people vibe. Joss goes for a run near the beach mansions, and saves a purebred show dog and is quickly hired on as a dog sitter by a grumpy older owner. Fast forward a little and the dogs' owner passes away and guess who inherits his beach mansion and money... yep, the purebred show dogs, along with Joss as the trustee. Guess who is not happy- his estranged son, Liam. Guess who have a lot in common... Joss and Liam- aside from the fact that Liam is fighting to get what he thinks is his inheritance. This was a fun, fast read. The dialogue was witty and the story moved along (with what felt like some movie magic- be prepared to suspend your beliefs a little bit about how easily some things wrap up0 just go with it). There were a few other storylines that kept the reading interesting. 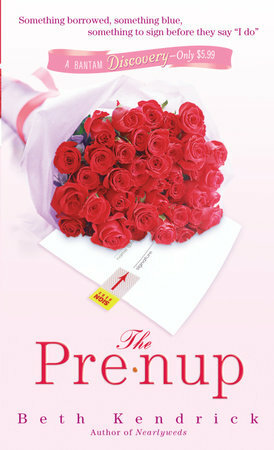 If you are in the mood for a light-hearted, fun, quick, romantic read, this is for you. It kept me smiling. I was unfamiliar with this author previously. I enjoyed her storytelling style. The characters were believable and the story was engaging. I realize it was an advance copy but there were a LOT of errors in the text and the editor in me was taken aback at that. It slowed down the reading to have to correct for context. However, I assume these will be/were fixed prior to publication. I truly did enjoy the book and will look for other works by this author. I really enjoyed this book. The characters and the story were believable and drew me in. And of course I love dogs. I recommend this heartily. This was my very first Beth Kendrick book. Thanks to First to Read- Penguin Books USA for the free copy of this book so I could try her out! I realize this was part of the Black Dog Bay Series of books, but I never felt that not having read the previous books hampered my understanding of the story and the characters. I am a dog lover and enjoyed this story a lot. Some conflicts were solved a little too simplistically for real life. But, this is a fictional world. And it's a happy place to visit. I enjoyed getting to meet some of the citizens of Black Dog Bay. I enjoyed Jocelyn's story. I would recommend this book to a friend. In fact, I will probably go looking for her back list of Black Dog Bay books and share them with a friend after i read them. by Megan Phillips, Washington, D.C. It was a cute story, but lacked any real depth. The plot was a typical cookie cutter romance with very predictable twists. There were a few editorial and grammatical issues, but overall an easy, quick read. This was a great book! The first one I’ve read by this author. What a great story. While I'm not fond of the title, this is a really cute book. It's light, funny, and enjoyable to read. There are a few grammatical and word errors in it, but not so many it's difficult to read. It has enough twists that you don't precisely know the ending, which makes it even more fun to read. Thank you to Penguin Books and firsttoread.com for the free copy of this book. Can you call a story adorable? This one is. Yes, it’s predictable. But it’s also funny, charming and quirky. It is an easy read and it flows along nicely. There are a number of editorial issues that need to be corrected, but they didn’t interfere with reading the story. I completely enjoyed it as a break from the heavier material I have been reading. What a cute book! The story flows nicely and, while a bit predictable, has a charming ending. The characters are well developed (even the dogs) and are highly relatable. It was truly a "can't put it down" book as I read it in two days! Thank you so much for sharing such a delightful story! In Dog We Trust is a cute sweet story. The cover is adorable with the pups. I could tell immediately what would happen shortly after the death of a cantankerous character. Jocelyn gets legal custody of the dogs and also receives a host of headaches. She's slapped with several law suits, which gets rather silly. Different strands of the story begin to come together as several decisions are made. An ugly painting in her possession turns out to be priceless, affording her the leverage to make changes. My favorite character, besides the dogs, was Nora. I liked her persona. Jocelyn, although likable, seemed somewhat flighty. Readers will delight in the latest Kendrick novel. Predictable romance story set in Black Dog Bay, Delaware, but with entertaining characters featuring local girl Jocelyn Hillier. Highlights include townies versus rich summer vacationers, an unexpected inheritance, estrangement from father/being raised by a single mother, romance with a previous adversary, and lots of Labradors. Thanks to First to Read- Penguin Books USA for the free copy of this book. Thank you Ms. Kendrick for a delightful read and peek into the lives of Joselyn, family and friends. This sweet, but not syrupy, story is told with enough depth to create empathy and connection as well as believability. The ups, downs and quirky side stories keep the pages turning. The lawyerly insights, insert non liability disclosure (don’t go there), is appreciated and useful. Yes, I am looking forward to the next installment of this saga, too many threads left hanging with lots of potential. Thanks again! Wonderfully written book! It was a fast read and I enjoyed it. The selfishness of people with money versus those that aren't so fortunate was very believable. Jocelyn's love for the dogs was obvious and I would love to know what happened with Lois...I would definitely recommend. Thanks, First to Read, for my advance copy. Ive loved Beth Kendrick’s books in the past but I couldn’t connect with these characters. They didn’t come across very likable and the storyline seemed a bit disjointed. It was a cute and fast read, but not one of my favorites. Pleasant quick read. I love the dogs. I'll look for more in this series.